Vintage tin wind-up toy in lithographed " Toyland SEE-SAW ". Made in Japan - Fine Toys. Represents two elephant musicians playing trumpet and drums. 7.08 inches (18 cm). Height : 6,1 inches (15,5 cm). Look at the pictures that are part of the description. Others countries : thanks to contact me. 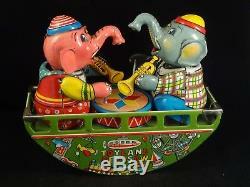 The item "Vintage tin toy wind up musician trumpet player elephant drums JAPAN Toyland 60s" is in sale since Thursday, October 26, 2017. This item is in the category "Toys & Hobbies\Vintage & Antique Toys\Tin\Character". The seller is "broc-toys" and is located in Arneke.